Ideally suited for the agricultural industry, this working platform is designed to fit to either your telehandler or loader of choice and will comes with quick hitch brackets to suit. These platforms are also known as a man riding baskets or man riding platforms. If you are working at height and require a safe working deck from which to do so, then our telehandler safety platform would be the perfect choice. 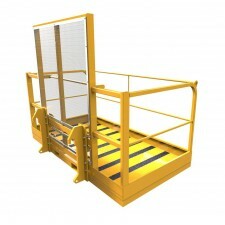 Please explore this safety cage in more detail by clicking on the product below.